Brands advertise their wares on social media all day, every day. But maybe you don’t have time to really shop right then. Then you have to save the post where it can be buried under all the news articles you’re going to read someday. Not cool. Make it easier with SHOPTHAT, the system that lets you shop Instagram and Facebook posts. This isn’t really an app. It works with Messenger. 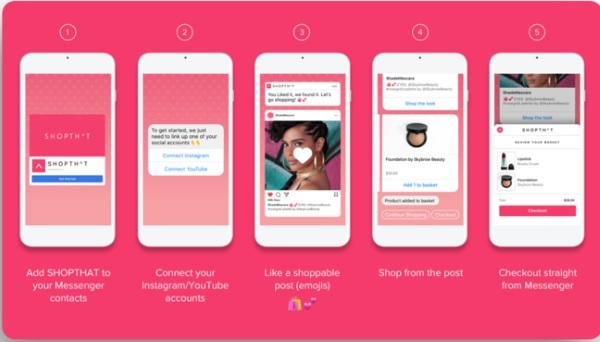 Just add SHOPTHAT to your contacts in the app and then whenever you like a shop that has the SHOPTHAT emoji, it sends you a message with all the products from the shoppable posts you’ve liked. This is an interesting system that removes some barriers from spending money. Mostly it’s focused on beauty and makeup brands but really there’s no end to what you can buy on the internet. As if you needed to make it easier to spend your money. Check it out on messenger.